Here’s a fun interactive Gun Selection Game from the NRA Blog. You can choose your favorite firearms in a head-to-head bracket, similar to the “March Madness” NCAA Basketball tournament. Here are all the Bracket Choices. Click Image to Zoom Out So You Can Read Gun Names. March is tournament time! 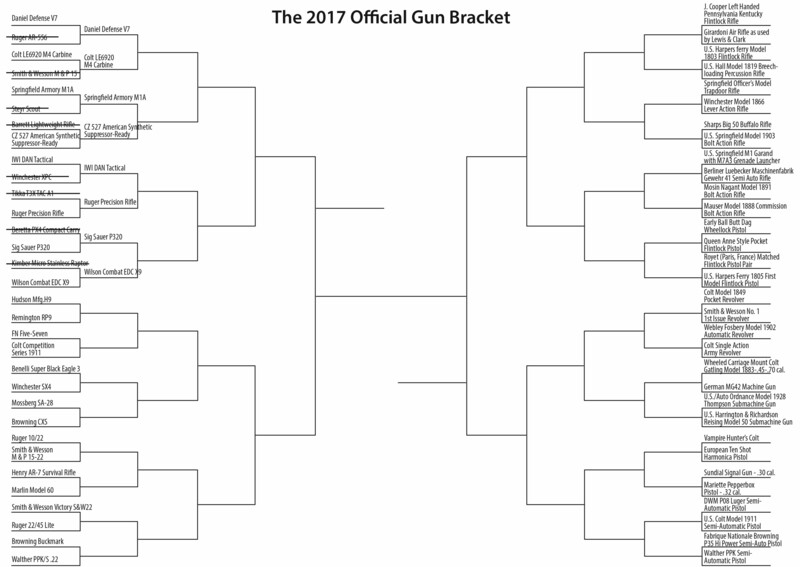 Here’s a tournament for firearms fans — the 2017 NRA Blog Official Gun Bracket. The NRA’s selection committee has narrowed the field of firearms down to 64, including 32 of the most popular modern firearms on one side, and 32 historical classics on the other. Here’s a Sample Bracket Question. CLICK HERE to VOTE. The guns featured include everything from flintlocks, early repeaters and single-action revolvers of yesteryear to the latest AR-15s, carry pistols, performance shotguns and precision rifles of today. Readers vote on each head-to-head matchup, determining which firearm prevails all the way to championship round, when the top historic gun takes on the top modern firearm for the final “Top Gun” winner. CLICK HERE to VOTE. Share the post "Vote for Your Favorite Firearms in NRA Gun Bracket"